So almost seven weeks into 2014 and what do I have to share? As is typical for me, not a great deal! ...a bit of a whacky assortment but great fun to do, and a great use of fabric and wadding that was to all intents and purposes "waste". Hopefully you are all joining in too, and Alison will be able to donate a good number of quilts to the orphanage in Mexico City. Also in the spirit of using up scraps I made this box pouch to hold all my larger sizes of circular knitting needles. I used this tutorial from Pink Stitches which was easy to follow and worked out well; my lining did turn out a bit baggier that I would have liked but that could easily be adjusted if I make another. Following on from the post in which I set out my goals for the year, I have made good progress with the yarn destash, I have sold some stuff via ravelry and found a few potential projects for the yarns I am keeping. I have also made a start on the City Sampler quilt, 15 blocks done so far. I love the way it's looking so far! I have backing fabric and wadding on order and just need to decide how to quilt it. 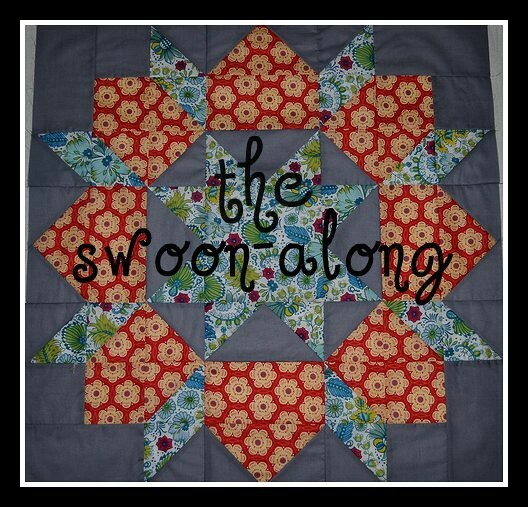 I am thinking of either vertical straight lines or having a go at machine quilting a baptist fan pattern similar to Camille's original swoon. I have come to realise that I am never going to be a regular blogger, and having stumbled across the Slow Blog Manifesto over at Catherine's I thought it would be good for me to join in (that equals at least one post a month, right?!). ...quite a productive month by my standards. 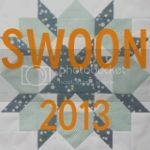 I made a bag, started a swoon quilt and completed my BOM blocks for July.